The High-priestly prayer is divided into three parts. The first part (verses 1-5) speaks of Jesus’ own relationship with the Father. The second part (verses 6-19), which is what you had heard in today’s gospel reading, speaks of Christ and His disciples. The third part (verses 20-26) deals with the relationship of Christ and His Church. By stringing these themes together, Jesus presents to us a powerful model for prayer, or rather the attitude or presuppositions we must have as the premise for our prayer. The first presupposition that is made, is that glory and suffering are not mutually exclusive. Jesus speaks of Himself being glorified by the Father. The manner of His glorification, the manner in which He will come to have authority over death and the power of evil is none other than the Way of the Cross. Jesus’ suffering and sacrifice on the cross will be His glory, and through His self-giving act, God Himself will be glorified. This seems strangely at odds with our notions of prayer. We often pray that suffering will go away and not the reverse. But the prayer of Jesus does not deny the reality of suffering. On the contrary, the prayer transforms the cross from a symbol of pain, humiliation and failure to one of joy, glory and victory. Christians do not pray away sufferings. Suffering, hardship and the cross are inevitable. We pray, however, that we may find glory in enduring our crosses so that God may be glorified. We pray that we may be united with Christ in the Paschal Mystery, the mystery of our salvation. We pray not just for temporary relief. We pray for eternal salvation. The second presupposition of the High Priestly Prayer is that, it assumes the sovereignty of God in the salvation of men. Man’s welfare or rather his salvation is God’s principal priority. It is God who provides leadership as we have seen in the first reading. In the gospel, Jesus prays in such manner because He understands and is convinced that it is God who lays the foundation for communities. It is God who provides the mortar to the Church for its unity. It is God who protects us from adversity. It is God who makes communities, not man. It is God who saves us, keeps us, cares for us and liberates us. Without God, none of this would be possible. Thus, any prayer should begin with this firm conviction and faith that, it has already been answered by God in the best way possible. The problem is that our prayers are often worded in a way where we have inserted a caveat or fail-save clause which betrays our lack of trust in God’s providence on the one hand, and a greater trust in our own devices on the other. Sometimes you hear people saying, “We’ve done all we can. The only thing we can do now is to pray.” We popularise clichéd statements like this “God helps those who help themselves,” treating them as if they were biblically inspired. Ultimately, these statements and beliefs are based on the premise that it falls principally on man to work out his own salvation and only when he has exhausted his resources, should he then rely on God. Therefore God would only be the second or last resort. That’s Pelagianism, not Christianity. We often turn to human machinations and try to brainstorm alternative solutions when faced with a crisis. What more can we do to promote vocations to the priesthood? How can we be more creative in attracting the young to religious life? How can we work on the unity of our members? How can we convince more people to come to our BECs? How can we bring change to the political culture of this country? We place greater faith on our structural abilities than on the power of prayer. To dare to suggest that we pray is to suggest that we don’t have a backup plan. 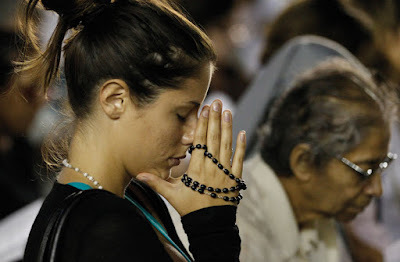 Therefore, many people often think that prayer is meant for those who are just not clever enough to solve their problems on their own, those who cannot resort to their rationality. We think that prayer is not for the strong. This explains why devotion before the Blessed Sacrament is never filled with men. Because men often pride themselves as rational beings, as Mr. Fix-it and Fix-all. So we tend to stereotype that prayer is meant only for old women, for the sick, and particularly for the weak – for those who have no recourses to any other solution except in God. There is a time for prayer and there is a time for action. But action often seems more tangible and dependable than prayer. But the recent General Elections debunked the myth that action and prayer are incompatible or at least that the former is superior to the latter. Many took to prayer, even keeping constant prayer vigils, fasting and novenas, whilst others went on the political campaign trail. A colleague of mine just after having cast his vote in the morning commented, “The ruling party will retain its hold on power. There is no way the opposition will win with all the odds stacked against it plus the unfairness of the whole process. The only way they could win is through some sheer divine intervention.” Well, I guess his words were prophetic without him realising it at that time. Whenever, we place our hope solely on man’s ability and potential to effect change, we are bound to be disappointed. Our human projects may meet with failures but we can be certain of this, God never fails and He can never fail us. Let’s never waver in our prayers.